Seema Punia bagged a silver medal for India while defending champion Krishna Poonia finished a disappointing fifth in the women's discus throw at the 2014 Commonwealth Games, in Glasgow, on Friday. 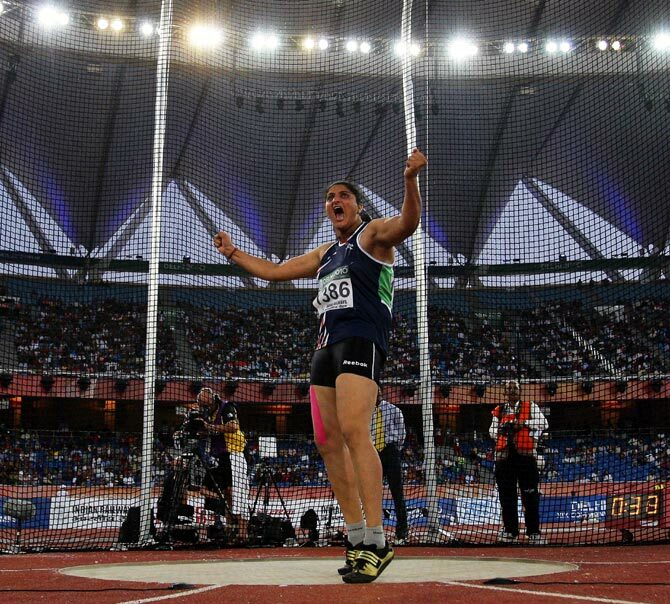 Seema, who won a bronze at the 2010 Games in Delhi and a silver in 2006 at Melbourne, hurled the discus to 61.61 metres, her season's best, to grab the silver, while a struggling Krishna could only come up with a below-par effort of 57.84m. Seema achieved her best throw in her penultimate attempt after coming up with 53.64m, 58.87m and 58.62m in her first three. Her fourth and final attempts were foul throws. The 31-year-old Seema from Haryana has now won a medal in each of the last three Commonwealth Games. Former World champion Dani Samuels won the gold comfortably with a throw of 64.88m, which she achieved in her third attempt. Jade Lally of England won the bronze with a best throw of 60.48m. Krishna has struggled throughout the season, even after recovering from a groin injury post the 2012 London Olympics. Her season's best was 59.17m though she holds the national record of 64.76m. Qualified in 11th place on Thursday, she began with a foul throw and her five attempts later on read 52.79m, 57.84m, 56.83m, 56.55m, 55.58m. Meanwhile, Sahana Kumari finished a disappointing eighth in the women's high jump final with a best effort of 1.86m. She has a personal best of 1.92m and season's best of 1.89m. Eleanor Patterson of Australia won the gold with 1.94m. Meanwhile, it was curtains for India in the men's 4x400m relay after the quartet of Kunhu Muhammed Pathanpurakkal, Jithu Baby, Jibin Jibin Sebastian and Arokia Rajiv were disqualified in the preliminary round..
India's ace squash players Dipika Pallikal and Joshna Chinappa were assured at least a silver medal by entering the final of the women's doubles. Pallikal and Chinappa beat the Australian combination of Kasey Brown and Rachael Grinham 2-1 (11-9, 7-11, 11-4) to seal a place in the gold medal match, where they will face the English pair of Jenny Duncalf and Laura Massaro. Earlier in the day, Saurav Ghosal and Pallikal crashed out of the mixed doubles, losing in the quarter-finals to Australia's David Palmer and Rachael Grinham. The Indian duo lost 2-0 (11-6, 11-9). India's Harinder Pal Sandhu and Chinappa also lost a hard-fought battle to the second-seeded New Zealand pair of Martin Knight and Joelle King in the mixed doubles quarter-finals. In a see-saw battle, the 10th-seeded pair of Sandhu and Joshana failed to hold their nerve in the third and final game and lost 11-7, 8-11, 6-11, dashing India's hopes of adding a medal to their tally. 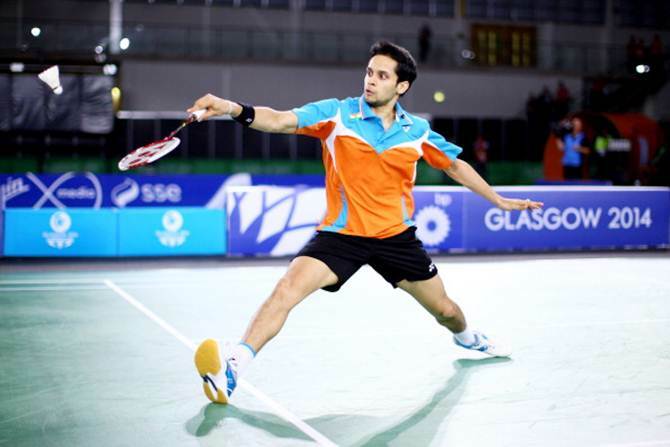 Indian medal aspirants P V Sindhu and Parupalli Kashyap scored straight-game victories in the women's and men's singles to storm into the semi-finals of the badminton competition. World No. 11 Sindhu hardly broke a sweat as she brushed aside New Zealand's Anna Rankin 21-10, 21-9 in 24 minutes, while Kashyap, ranked No 22, needed 38 minutes to beat Malaysia’s Daren Liew 21-13, 21-14. Sindhu, the World Championship bronze medallist, will next take on Canada's Michelle Li, while Delhi Games bronze winner Kashyap will meet Rajiv Ouseph of England at the Emirates Arena. Sindhu and Kashyap had lost their respective matches against Li and Ouseph during the mixed team event against England and will be desperate for revenge on Saturday. India's R M V Gurusaidutt followed on compatriot Kashyap's footsteps and qualified for the semi-finals of the men's singles event with a hard-fought 21-15, 8-21, 21-17 win over Chong Wei Feng of Malaysia in a 67-minute duel. He will face Derek Wong of Singapore in the last four. It was good news for India in the women's doubles event as well as defending champions Jwala Gutta and Ashwini Ponnappa stormed into the semis with a comfortable 21-10, 21-9 win over Sri Lankan pair of Achini Rathnasiri and Upuli Weerasinghe. 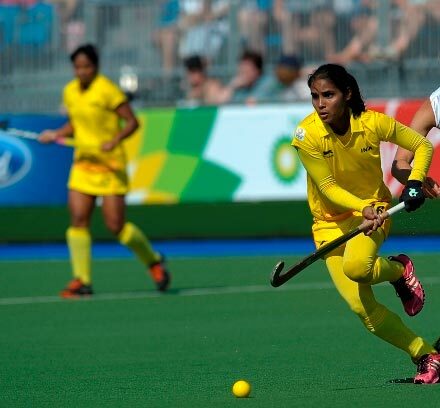 The Indian women's hockey team beat hosts Scotland 2-1 to finish a disappointing fifth in the 2014 Commonwealth Games. Anupa Barla and Poonam Rani scored two quick field goals in the second half to earn the team a consolation victory. Nikki Kid’s penalty-corner goal reduced the margin for the Scots. For the second successive Commonwealth Games the Indian women’s team failed to win a medal. They were champions in the 2002 edition at Manchester. The first half was tepid, with both teams unable to convert chances. However, the exchanges were intense in the second period which saw three goals being scored in the space of four minutes. Barla slammed a low shot into the net after picking a deflection in the danger area to put the Indian ahead. Scotland though took no time to equalise, kid flicking the ball to the top left corner of the post. Soon after, an unmarked Rani in the rival D gave India the decisive lead by smashing the ball comfortably past Scotland goalkeeper Amy Gibson. "Having played Scotland the last time, they beat us 4-3. It was nice to come here and win today (Friday)," said Rani. The result could have been different had Scotland scored more from their eight penalty-corners. They just managed one. "It was a game of two halves. Scotland took over the game in the second part. We conceded a silly goal," said Neil Hawgood, India's Australian coach. "In the end, everything went well for us. We got the points to keep in the same ranking spot. It's been a fantastic experience. It is good for us to play in this environment since we have the Olympic qualification later in the year. Indian gymnast Ashish Kumar's campaign in the Commonwealth Games ended on a disappointing note as he finished last in the men's vault final due to a fall on the mat. Ashish had won the silver medal in vault and bronze in the floor event at the 2010 Games in Delhi, becoming the first Indian gymnast to win a medal in the Commonwealth Games, but failed to repeat his feat. Having finished sixth in the floor event final on Thursday he ended his campaign on a faulty note after failing to land on his feet in his second vault. He scored a decent 14.333 in his first, but landed flat on the mat on his back instead of the feet while trying for a somersault in the air. Due to the ugly land, he did not get points from his second vault and accumulated 7.166 on the average to finish last in the 10-man field. The average of the two vault is taken as the final score. Canada's Scott Morgan won the gold with an average score of 14.733 while Kristian Thomas of England and Toon Wah Hoe of Singapore bagged the silver and bronze with 14.499 and 14.195 points respectively. India's lawn bowl men's fours team missed out on a historic bronze after it squandered a huge lead midway into the match and lost to Australia in the third-place encounter. 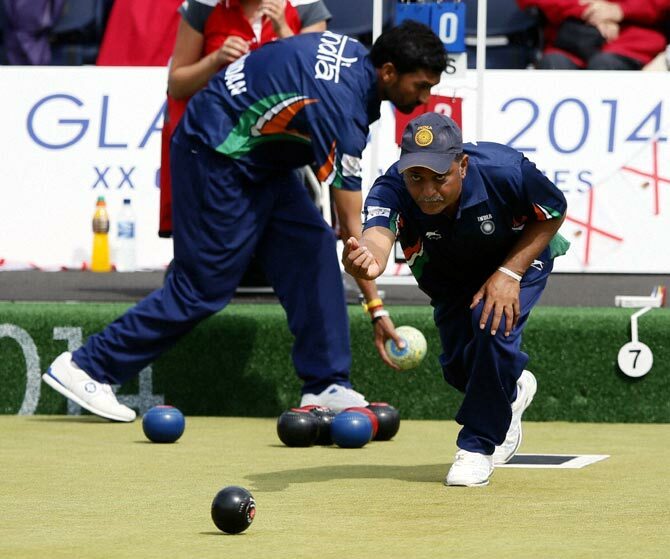 The team of Kamal Kumar Sharma, Chandan Kumar Singh, Samit Malhotra and Dinesh Kumar was leading 11-5 after the eighth of the 15-end match and came agonisingly close to creating history before losing the bronze-medal match 14-15 at the picturesque Kelvingrove Lawn Bowls ground. India has never won a medal in Lawn Bowls in the Commonwealth Games. The best performance in the event before this was the women team's fourth finish at the last Games in Delhi. The Australians immediately struck back in the ninth end and narrowed down the gap in scoreline to 9-11. But the Indians were also not the ones to sit back and they led 14-13 going into the final period. But to the horror of the Indian camp, their players could not score in the 15th and final end while Australia scored twice to win the bronze. Team member Samit Malhotra said it was disappointing to have finished empty-handed despite coming so close to winning the medal. "We are very disappointed with both games going to the last end. We were leading by one and lost two at the last end, which was disappointing. We are happy for reaching the top four but a medal would have been the cherry on top of the cake. To reach here and lose like this is disappointing," he said.